Surya (Allu Arjun) is a soldier with anger issues. His superior sends him to a psychiatrist and a top professor Raju (Arjun Sarja) for an evaluation. Surya is very passionate about guarding India at the border and the only option is to go through the psychiatric evaluation. In the process, he is asked to maintain calmness for 22 days by not getting himself into any trouble. Rest of the story is all about what happens when he keeps mum by suppressing his natural instincts and by masking his inner personality. Allu Arjun: Allu Arjun shows complete transformation with his looks. He is like a man possessed in a few action sequences. He has shown terrific intensity in the last portions of second half where he realises that he is killing his true-self by compromising. His hardwork and conviction is evident in fight sequences and dances (especially the caps feat in Lover also song). Allu Arjun brings a lot more to the table and gives an additional push to the film with his contribution. Others: Anu Emmanuel is good in a limited role. Arjun Sarja is very good as a psychology professor. Boman Irani is there in beginning portions of the film. Nadhiya has a limited role. Rao Ramesh is seen in few scenes. There are too many baddies (Sarath Kumar, Pradeep Rawat, Harish Uttaman & Anoop Thakur Singh). Sai Kumar is impactful in an author-backed role. Vennela Kishore gives a slight relief in this serious film. Rao Ramesh has a brief role to play. Vikram Sahadev makes a mark as an agitated youngster. Story - screenplay - direction: One aspect of the film (Soldier with anger issues sent for a psychiatric evaluation) is inspired by a Hollywood film titled Antwone Fisher (2002), which is based an autobiographical book. There are many threads in the film - love thread, family thread (specifically son - father) and villains thread. Director Vakkantham Vamsi has written a powerful characterization to hero and it’s consistent throughout. The character arc of hero in second half is very good and there is honesty. The scenes in latter part of second half are powerful. But, the director didn’t write love part and family part in convincing way. There is no proper love or chemistry between lead pair. The relationship between Surya and professor character is unconvincing. There is no novelty in villains characterization. But, the director had to incorporate all these threads to satisfy all section of audiences. A few logics are missing in the film (why do military tolerate such an undisciplined soldier who keep breaking rules with no respect for the order & how such a learned person disown his child and treat him as an unwanted kid). However, you can see that director gets to the core point of the film in second half and make sure that it’s filled with intense moments and genuine emotions. There is a lot of depth in crucial scenes (especially Surya speech in auditorium in second half and all scenes involving Sai Kumar). Other departments: Music by Vishal - Shekhar duo is good. I personally liked Sainika song and Lover Also. The re-recording and mixing in Sainika song is classy. Cinematography is good in most of the film, but inconsistent in some scenes. I have liked the way camera is used in action sequences (rotating 360% in one shot of police station fight and camera movement in tunnel fight). Dialogues in the film deserve an applause. Dialogues create a lot of impact by explaining about loving yourself and being honest and passionate about what you do. Fights in the film are excellent. 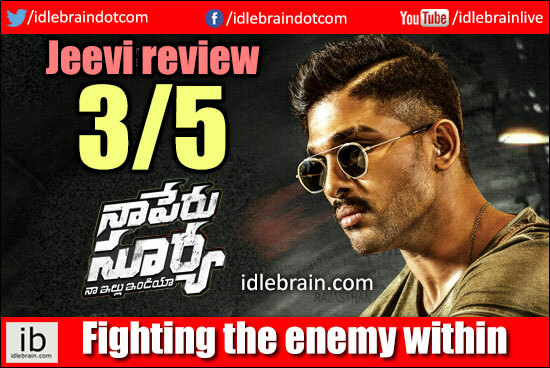 Allu Arjun looks and hunts like a predator in the fight before climax (at Sai kumar place). Editing is alright. Production values by Ramalakshmi Cine Creations are grand. Analysis: First half of the film sets up the plot and is alright. Second half of the film has good writing and intense scenes. Though the director tried to cater to all cross section of audiences by having all types of elements in the first half, he made sure that he sticks to the basic plot of the film towards climax. Allu Arjun stands out in the film with his stylish and terrific performance. Core plot is handled well. But the infusion of commercial elements play spoilsport. On a while, Naa Peru Surya is a film that genuinely explores about fighting your own weakness and fighting the enemies within India!